Weird Things » Blog Archive » Can Increased Cryptid Sightings Be Blamed On Global Warming? Can Increased Cryptid Sightings Be Blamed On Global Warming? Many mistaken cryptids are actually just fugly animals with a bad case of the mange. So what does that have to do with our planet’s current case of global warming driving and increase in sightings of potential Yetis, Bigfoots and Chupacabra? “Down here, animals don’t die of mange, because the temperatures are warm enough,” Bowdenchuck said. 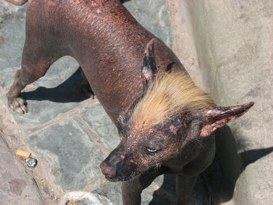 Rather, the animals live with mange. Animals that have lost their fur are more vulnerable to the cold, so in warmer climates they live longer (and be more likely to be seen). Thus one might conclude that sightings of hairless animals will become more common as the climate warms. The extended forecast calls for more non-Bigfoot, non-Yeti, and non-chupacabra mangy monster sightings. Why wasn’t this the poster for An Inconvenient Truth?